Electric meat grinders are tailored cut for fulfilling the purpose of cranking to grinding the meat within a short period of time and obviously with fewer efforts. While meat grinders are not distanced apart from every model but there might be the difference of attachments that would surely make a difference in your choice. You just need to find the best electric meat grinder to make the process easier. To make your task easier, below is a list of top 10 electric meat grinders that gives the right grind in no time. Speed and accessories: STX has installed a heavy-duty motor of 1200 watts that has the capacity to grind 320 to 360 lbs of meat per hour. Turboforce 3000 is loaded with tons of accessories. Different size of grinding plates is there to grind different meat whereas the sausage stuffing tubes help you in making the delicious sausages at home. Moreover, the kubbeh attachment lets you taste the oriental dish at the comfort of your place. This automatic meat grinder also comes with a detailed manual that provides a guide for easy setup of the device and tips to grind meat. 3-speed technology: while most meat grinders come with one or two-speed variants but this is equipped with three-speed technology. While most of the meat grinding is done on the highest speed the sausage stuffing is done on lowest one. It also has a stop, reset and a reverse button for swift grinding. Construction: the grinding head is cast with polished aluminum, which ensures durability, and effortless cleaning. Its 1/8 inch hopper opening helps in grinding large portion of meat at once. Grinding plates: three variants of plates are induced to this device for course, medium and fine grinding by a wagon wheel, medium and small plate, respectively. Construction: The grinding head of this electric meat chopper machine is made from cast aluminum for long life whereas the interiors are designed with a little space between to make sure that all meat comes out smoothly. Other accessories are made from stainless steel with food grade lubricating oil. All red copper wiring is done to improve the durability of the motor. Efficient and fast: this sturdy 800/2200 watts copper constructed motor grinds through the toughest of the meats for a fresh and flavourful mincing. Now you can create a pristine grind for every occasion. Accessories: it is equipped with three stainless steel blades for a variety of mincing from coarser to finer. Moreover, it has kubbeh attachment, sausage funnels, and a food pusher to make tastiest of the recipes. Designing: this appliance comes with a strong food tray for easy storage. Its simple four operating buttons with two power levels are the most striking feature added by Gourmia. All parts are removable for a trouble-free cleaning and a lock is equipped for a sturdy operation. 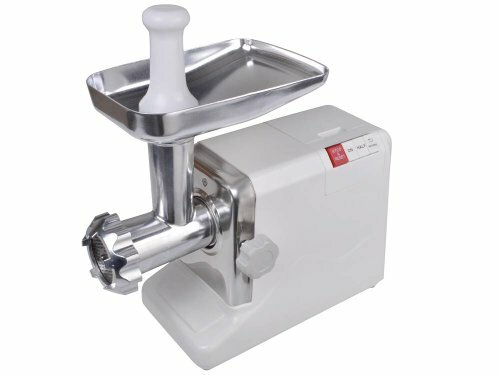 Facile grinding: Grinding meat has always been a problematic task in every kitchen but with the top notch and easy functioning of this appliance, you will be able to mince toughest of the meats. 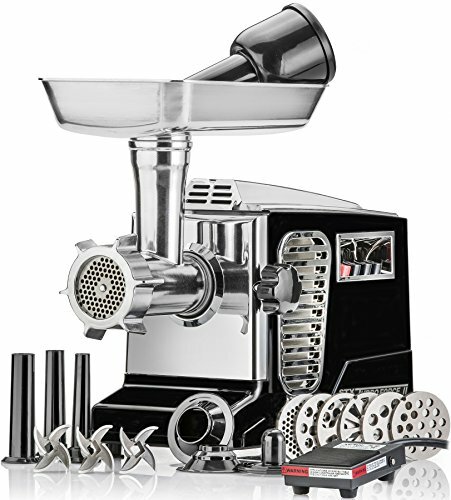 Operation and cleaning made easier: The only mincer you can rely on is the MMG 3001 is equipped with an easy to use control panel with 4 buttons. Moreover, you get a detailed manual to cook tastiest of the recipes. Design to go with any kitchen: With its attractive designing, this electric meat chopper machine is made to suit every kitchen setup. Whether it is a contemporary, a Victorian, or even a traditional setup, it has the capability to match with any counter. Warranty: Magic Mills has always aimed at producing appliances, which are of best quality but there may be times when a discomfort might occur. To incur this a customer support service and one year warranty is added. Ready ingredients in minutes: Now prepare ingredients in a few minutes with help of various attachments. With an add-on food pusher, you can control a number of ingredients and spices to add in your dishes. 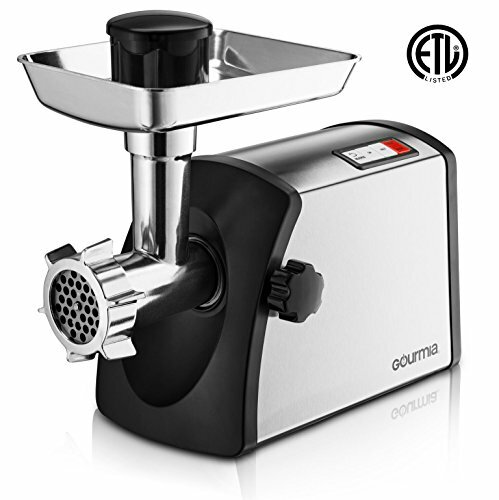 Design: This is onother top class electric meat grinder which has a futuristic design that completely compliments any type of kitchen setup. Available I chrome accents and fitted 2000 watts powerful motor it can mince toughest of the meat without any bogging at last. The 4 air cooling intakes are engineered to keep this appliance cool while grinding. Electric foot pedal: this is equipped for hands-free operation. It comes in handy when filling sausages. Accessories: tons of accessories are featured with this appliance like polishes aluminum grinding head, 3 stainless steel cutting blades which are dishwasher safe, 6 grinding plates, 3 sausage fillers along with an adapter and one kubbeh attachment to make the tastiest of the oriental dish at home. Meat pusher: this is specially designed to push the raw meat into the grinder. Instead of using your hand, simply push the meat with this pusher. Parts packer: this is an all accessories storage tube, which is capable to accumulate every removable part of this device. Functioning: now grinding farm raised meats for hamburgers, sausages, meatloaf and more is much easier than before. Its extra-wide offset head offers highest speed and steel engineered parts equipped for quiet operation. The motor is permanently lubricated and has an air cool system for precise and lifetime work. 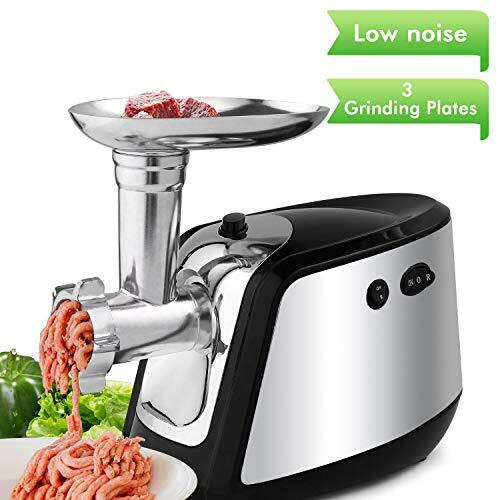 Moreover, this electric meat grinder for home is a certified grinder for commercial use having the capacity of grinding 18 lbs of meat per minute. Designing: A user-friendly product designed with fully effective blades eliminating the chances of injuries. A food pusher is featured to work hands-free and out of the feeder. Functioning: Multiple accessories are equipped with this appliance for coarser to finder grinding of not only meats but also fishes. Its easy functioning with 4 button variants results in a satisfied mincing. Customer service: The ETL certificate makes this appliance wholly safe to prepare delicious dishes. Moreover, the 24 hours customer service and 12 months replacement warranty with a lifetime support guarantee makes it a leading choice for many. A modern kitchen tool with a stainless steel finish resists fingerprints and other exterior damages. Metal gears and a heavy-duty handle makes this device more efficient and durable. In addition, it is lubricated with an improved grease formula to reduce noise while grinding. Built-in circuit breaker, large meat pan, stainless steel head and knife including a meat stomper helps in a finely shredded meat according to your preference. Five-year warranty and a lifetime support make it an even more worthy purchase. 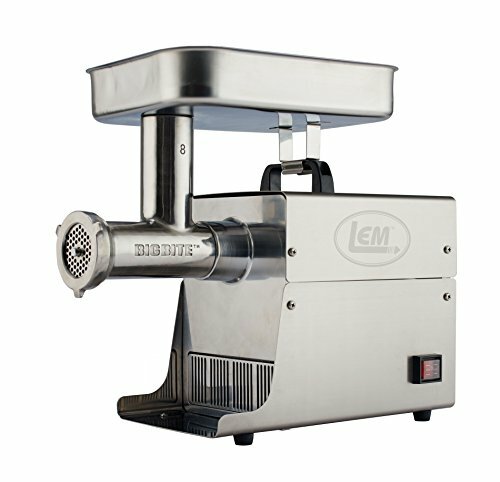 LEM equipment: every part or accessory made by LEM is dedicated to delivering high quality of meat grinding. With this heavy-duty device, anyone can become the master chef by controlling the health content and taste in their dishes. This appliance is a pristine balance of affordability and functionality. This powerful and quick grinder works on pork, beef, poultry, and venison. 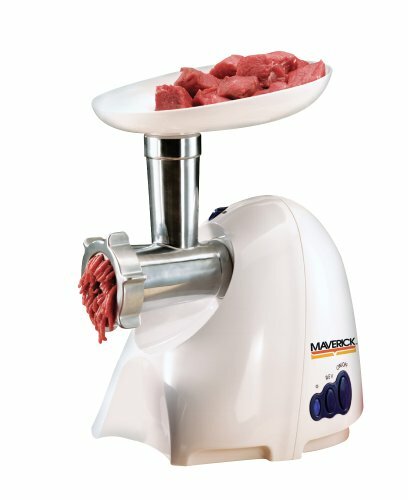 Maverick’s great quality of meat grinder with a sturdy 575 watts motor, it helps in saving time and energy for bulk grinding. It is the best appliance for making delicious hamburgers and even baby food. Moreover, it also features in a reversible motor to retrieve clogged food for an easy clean-up. Maverick has equipped an automatic thermostat to protect this device from overheating. 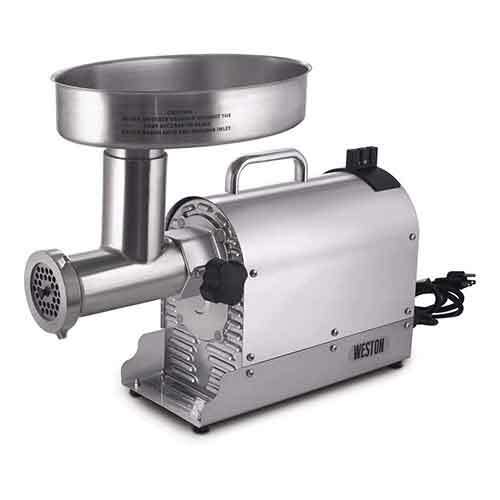 Sturdy function and versatile accessories: this high-quality electrical meat grinder with a tough power of 2000 watts is versatile and equipped with multi-functioning that enables the one with home-cooked meals such as sausage, meatloaf, burgers and many more. The cutlery or accessories are made with high-grade stainless steel for a coarse, medium and fine mincing of the meat. A healthier way of preparing your own food starts with this appliance. It is featured to generate desired cuts every time. The feeding hopper made with cast aluminum is actually what every kitchen needs. It lets you control the ingredients and prepare the dishes accordingly. A smart consumer is the one who never compromises on the quality of their kitchen appliances, especially when it comes to the meat lovers. 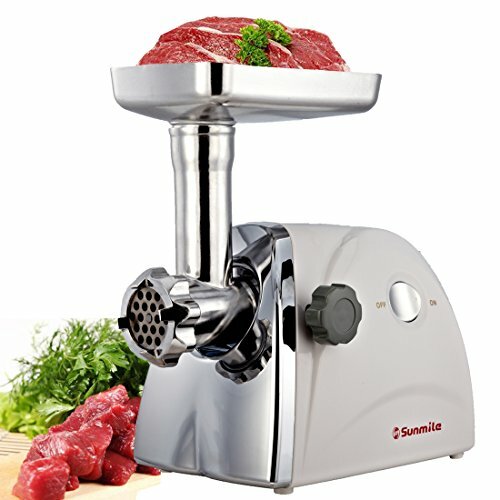 If you are searching for the best electrical meat grinder for home use you should even be more careful. 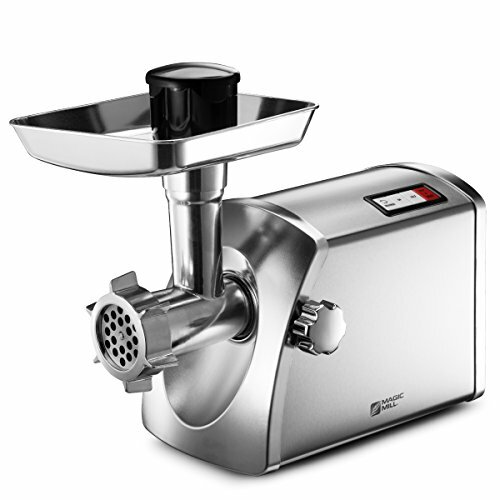 Having a meat grinder at home ensures your total control over the whole process including the thickness of the meat and taste of your dish. Moreover, cooking at home avoids the use of chemicals and preservatives in the meat products. Whether you cook for yourself or for your relatives or friends, this sturdy kitchen appliance is the only thing you need not only to crunch meat but also to grind corns, spices, garlic or even which helps in preparing your baby food. 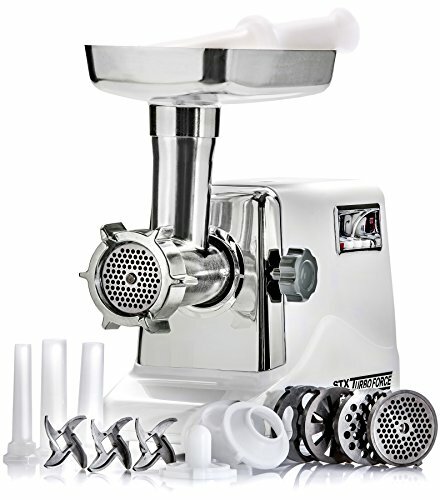 Another thing is, if you are short in a budget, you may want to go for a manual meat grinder since most of the electric meat grinders are expensive. No matter which grinder you opt for but make sure it does the required tasks well without any future regrets. It is always advisable to go for a quality product regardless of its cost but if you are on a budget and pursuing cooking as a hobby then going with a basic electric meat grinder is no harm. Hope our electric meat grinder review would help you in selecting the best one suiting your preference and of course your budget.